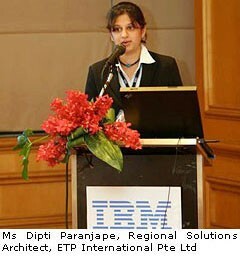 On 16 May 2007, ETP International and its business partner 4Bizinet Co. Ltd supported the IBM Solutions Day held at the Intercontinental Hotel, Bangkok. The full day event attracted more than 150 retailers in the Thai wholesale and retail industry. The event offered retail and wholesale insights in the morning session and split into two tracks in the afternoon – Cost Reduction and Revenue Growth. Ms Dipti Paranjape, Regional Solutions Architect of ETP International was invited as a speaker in the Revenue Growth track in which she shared on how technology can be leveraged to increase business revenues and improve operational efficiencies. Delegates also had the opportunity to get a hands-on demonstration of the ETP V5.2 solution showcased at the ETP International and 4Bizinet booth.